"The Playoffs are a different beast,"' is a statement I write to many a player in the league. When a regular season ends, the division standings show a pecking order of where the players are in reference to each other. Players who won the minimum number of matches required to make it to the playoffs (usually 4 or 5) could have had very different stories within the same season. You might have some players who breezed through with awesome seasons and only one or two losses, whereas others had to play over 15 matches to get the needed wins. A great aspect about our program is that a player who ends a roller-coaster season as 5 wins-12 losses can still make the playoffs. If someone's able to connect with so many players during the regular season, an exciting playoff experience is well deserved. When the playoffs start, the slate is just about wiped clean. Although players with the best records start off with the highest seeds (and therefore could get a first round bye), the beauty is in the inevitable upsets. We've seen so many last seeds win the playoffs that the thinking 'the hottest player during the playoffs tends to win' is usually true. This Winter Season has one such case; In Tennis Orange County, AJ Patel has won 5 Advanced Championships in a row. That changed this season, when Rob Ryan – who had 9 losses in a row – finally got his first big victory. It was a huge semi-final playoff win against AJ with a stunning 1-6, 7-6 (14-12), 3rd set tie-breaker 6-0 win. 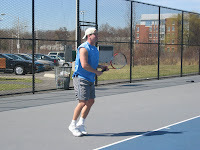 It’s Tennis Weather. Get Out Your Racket!